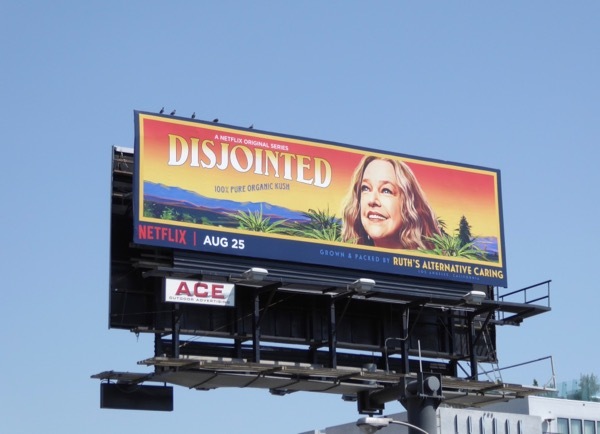 Labor Day may be over and some people may be back to work today, but here's a collection of billboards for Netflix's new stoner comedy, Disjointed, to keep you feeling chilled out. 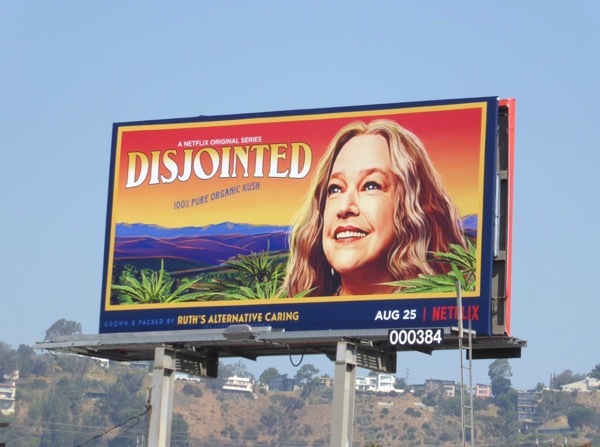 Kathy Bates stars in the the new cannabis sitcom from Chuck Lorre and David Javerbaum as marijuana lawyer, activist and legend 'Ruth Whitefeather Feldman'. 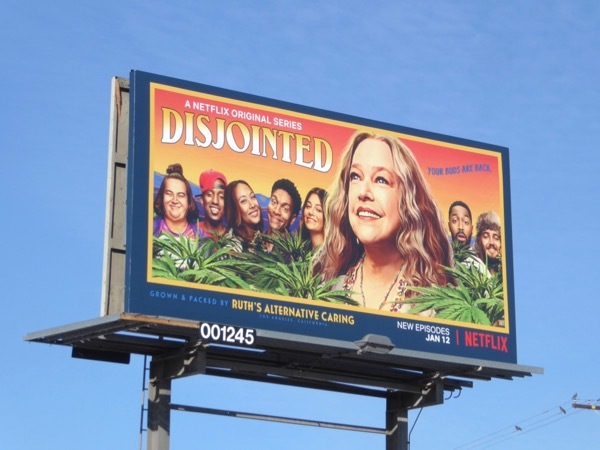 In the surreal smoke-filled episodes she employs her newly graduated son and a team of young 'budtenders' to help her run her legal pot dispensary in L.A.
With hits like The Big Bang Theory, Two and a Half Men, Mom and Mike & Molly under his belt, can Lorre deliver another buzz-worthy comedy with high ratings. 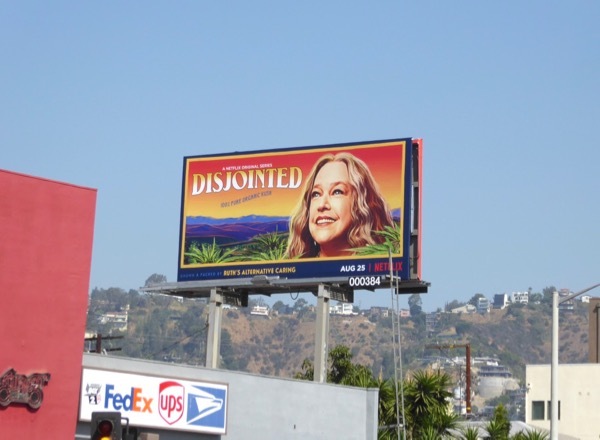 The standard series launch billboards were snapped along the Sunset Strip and Fairfax Avenue from August 26 to August 31, 2017. 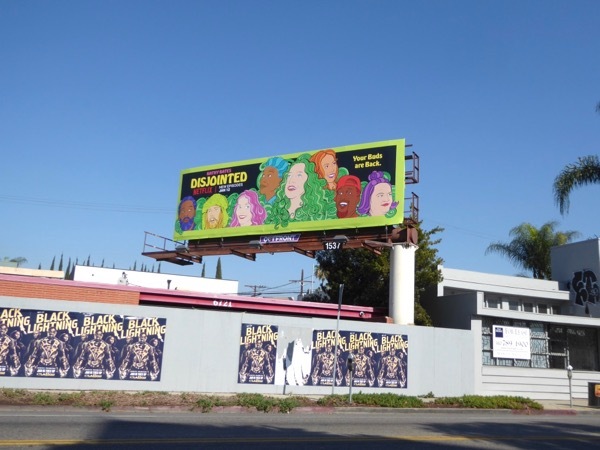 Meanwhile the neon moving hand billboard installation was photographed and filmed above the Sunset Strip's Whisky A Go-Go club on August 31, 2017. 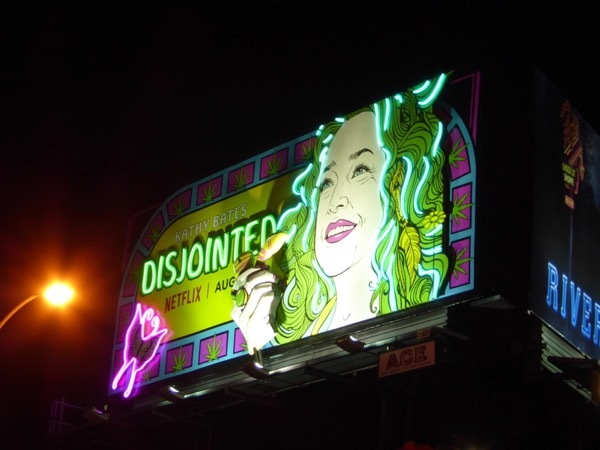 The show-stopping spectacle built by Atomic Props & Effects features flat cut-outs, a motorized hand and LED flex neon. 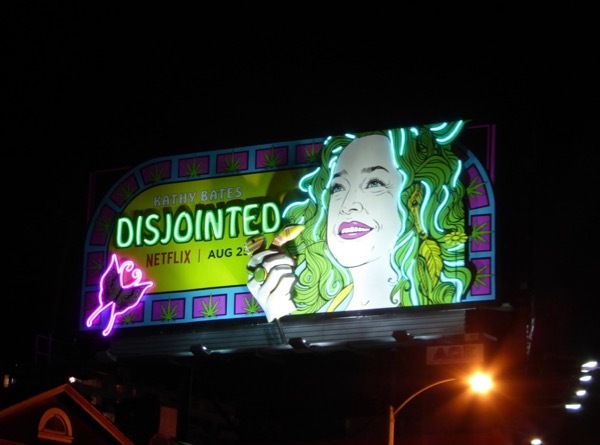 This fun idea reminds Daily Billboard of this moving leg neon sign billboard for Inherent Vice from 2014. 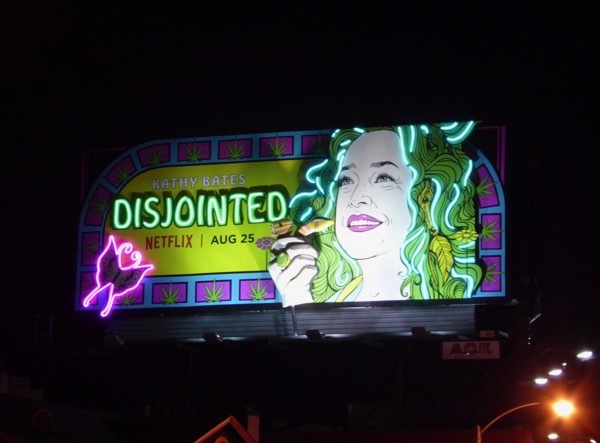 Plus for more amazing installations from Atomic Props & Effects check out this glowing eyes billboard for Queens of the Stone Age's new album, this 3D crashed UFO billboard for Rick & Morty and this 3D glowing lightsaber billboard for Disneyland's Star Wars Awakens. 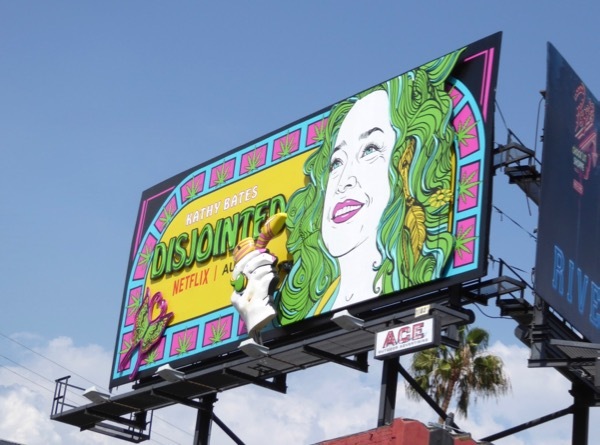 Meanwhile for more pot-themed TV series, make sure you also check out these Weeds billboards, this Weediquette billboard and these High Maintenance billboards. 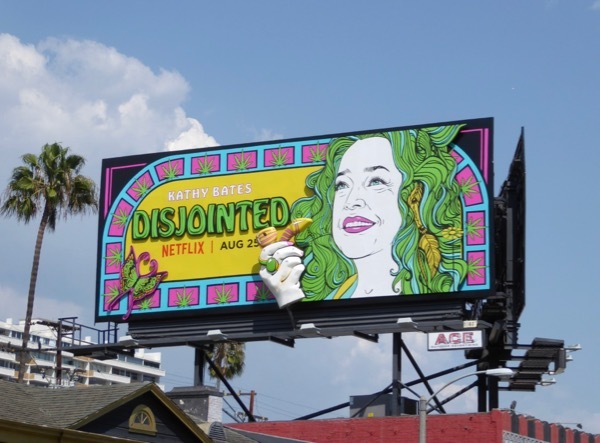 You'll just have to stream the show yourself to see if this new strain of comedy is as fun as the outdoor ad campaign for Disjointed. 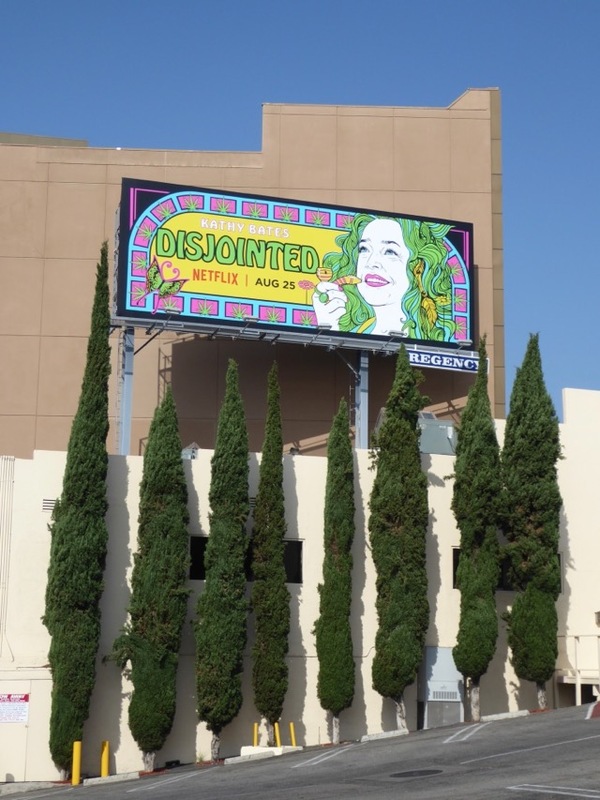 UPDATED: Here's also a billboard for the second part of the first season of Disjointed with all-new episodes, spotted along Melrose Avenue on January 10, 2018. 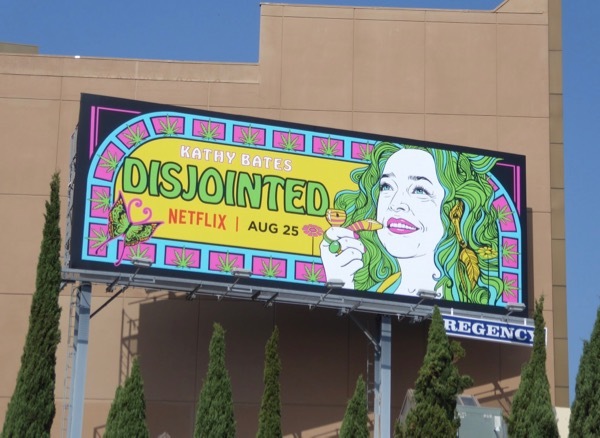 With the recent legalisation of pot in California there's never been a more timely comedy to get high to. 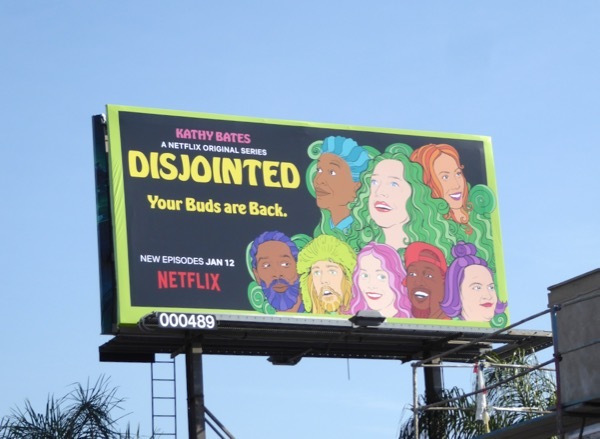 Plus here's a smaller version of this ad creative spied along Fountain Avenue on January 12, 2018. 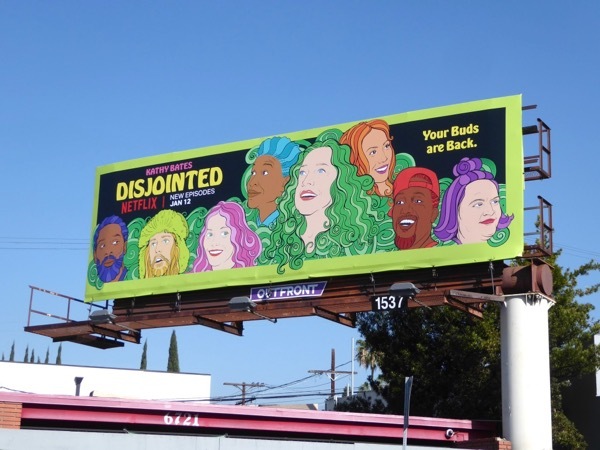 And here's another non-illustrated version featuring the cast of Disjointed snapped along Santa Monica Boulevard on January 13, 2018.